Hi, That cover art thread is super in-depth and informative, but I don't think I'm ready to submit to the cover critic site. For one thing, this is just a screen shot, and two I'm not the artist. 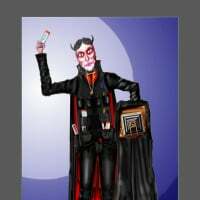 I have an amazing friend helping me out with this image and I already appreciate what he's done so far. I'm not in a position to pile a bunch of criticism on him. My book is about four stoner ski bums in the 90's who pull a heist. My target audience is basically the subcultures of skiers/boarders, snowmobilers and stoners.....who read. So we'll see how it works out, so far test readers outside of those groups have also enjoyed it. I plan to finish details to the skis and the snowmobiler silhouette. Then a tag line will go in the bottom corner, something like "250 pages of Rocky Mountain Mayhem!" I'm really excited to make this and I think Lulu seems like the right place for it. So let me know what you think, especially if there are any major red flags. I have seen covers like this, and I immediately guessed the genre on seeing the art. It looks (in broad terms) like many 1970s paperbacks. I would expect, from seeing the cover, a story like "Hot Dog ... the movie" (a 1984 skiing comedy), or like the John Nichols book, "The Milagro Bean Field War" (a 1974 book that had nothing to do with skiing, but had the sort of plot pacing, anecdotes, and ribaldry that I would expect of this book). I think that this cover would generally pass muster for that sort of book. If, on the other hand, you're writing an existential masterpiece which will finally answer the question why Mersault shot the Arab five times, and not simply once, well, a different cover would be in order. I might question the Title. Also, the skier looks triumphant, but also in the middle of a serious wipeout, and/or avalanche. In this style of cover, that's not a big flaw. I think the title needs to be considerably larger. And a little less covered by snow. The one thing you never want to make obscure on a book cover is the title! I am not at all sure why the main part of the painting is framed by the red/orange tree silhouettes. This doesn't seem to add anything at all to the cover other than to make it even more complicated and busy than it already is. Oh! There's a snowmobiler in the picture! I had no idea until I read your description. So that's what that black blob is. I think you might want to make the figure a lot more clearer. And if he is supposed to be threatening or chasing the skier, make it obvious. Finally, I think you might want to get across a little better that the "book is about four stoner ski bums in the 90's who pull a heist." I really see nothing at all to suggest that. My book is about four stoner ski bums in the 90's who pull a heist. My target audience is basically the subcultures of skiers/boarders, snowmobilers and stoners.....who read. I had to look for the snowmobiles after you had said they are there, but even so I don't recognise it as one, and I can only see one. I plan to finish details to the skis and the snowmobiler silhouette. If you are going to have a snowmobile on, it needs to be more obvious, and perhaps not a silhouette. Then a tag line will go in the bottom corner, something like "250 pages of Rocky Mountain Mayhem!" I would leave that for the back cover within the Blurb. Sticking it on the front does not mark it as fiction. And I agree with Ron, too. In fact I also think it's a bit too 'busy.' It's a bit like a 1960's travel poster. Perhaps lighten the dark blue? Even blur the shades together? It is eye catching though. Thank you guys so much for all the input, I appreciate all your time and insight. I was thinking the title letters should be bigger, and I would like to drop the snowmobiler all together. I definitely am going for a 70's pulp paperback look. I can understand the confusion with P.O.W's, but with skiers pow is slang for powder. And powder is almighty. So you all advise against any other content besides Title and author on the cover? Save the blurb for the back cover. Fantastic! I will take all this to my artist. Skoob, Kevin and Ron thank you again! Yeah...I think that all you need is the title and author on the cover. And focus on the most important elements, those that most immediately catch the eye and suggest something about the subject or nature of the book. Zoom in, for instance, on the main art and forget the frame of trees, which really add nothing at all. Thanks, too, for the explanation of POW. Fortunately, it's not a bad title since it can be interpreted as some sort of indication of action even if one doesn't know the connection with skiing---which I did not (a good rule is to not aim your book at such a narrow market that only the initiated will understand the cover or the title. Certainly not everyone who runs across your book is going to be a skier! A good example is the confusion the others in this thread had regarding the title.). I am not sure you have achieved that. Why not call it Powder then? I would advise against the words you had planned, at least. Save the blurb for the back cover. Fantastic! I will take all this to my artist. Ok, but make sure he/she is designing for the exact shape and size you require from Create. Skoob, Kevin and Ron thank you again! And focus on the most important elements, those that most immediately catch the eye and suggest something about the subject or nature of the book. Zoom in, for instance, on the main art and forget the frame of trees, which really add nothing at all. I thought the orange was supposed to be flames, but they do indeed add nothing to the art. Are they supposed to denote excitement? Why not enlarge just the area with snow etc., in it to fill the whole front cover? And what is the strange blob at the bottom right corner? I would enlarge your name, too. Often a writer's name becomes more important than the title. That is sort of true, but to the many countries that did have P. O. W. camps in them, that's more or less all it will mean. No, I had never heard of it either, even though it's now a Winter Olympic sport shown on TV. (a good rule is to not aim your book at such a narrow market that only the initiated will understand the cover or the title. Certainly not everyone who runs across your book is going to be a skier! A good example is the confusion the others in this thread had regarding the title.). Quite so. 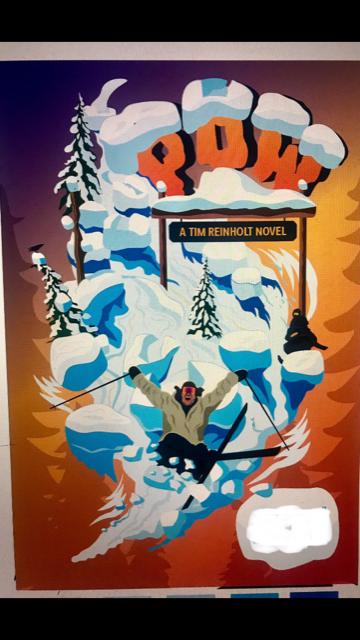 Not even with the addition of a skier and snow had it occurred to me what the cover means by POW, and the title is a bit hidden anyway. Maybe call it "Snow POW"?